Welcome to BearSaver's BearInfosite.Com. We have put together this website to pass on some of the information and resources about bears that we have learned about in our business. Bears are much better off when they do not have contact with humans. In that spirit, we manufacture a complete line of bearproof refuse and recycling receptacles that are in use by many parks and recreation organizations. 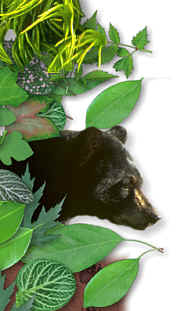 Many homeowners that live in bear country use our products as well. Enjoy your visit here, and please come back often. To get started, click on the bear tracks at the bottom of the page. We value your suggestions and comments, just click on the "Feedback" sign from any page. If you live, work or play in Bear Country take the time to get to know about bears... Always be "BEAR AWARE"
Bear, any of several species of a large carnivorous mammal, related to lesser pandas, raccoons, and members of the dog family. A bear is distinguished from members of the other carnivore families by its heavy body; short tail; short, rounded ears; and plantigrade feet (both heel and sole touch the ground, as in humans) with five clawed toes. It also lacks the shearing teeth common to most carnivores; the crushing molars of a bear are believed to be an adaptation for a plant diet. Although all bears are classified as carnivores, the different species vary widely in their feeding habits. For example, the polar bear feeds almost exclusively on seals and other animals, but it may also graze on vegetation; the grizzly eats grasses, herbs, berries and nuts as well as living or dead fish and other animals. Source: Microsoft Encarta: Article "Bear"